Combining structured noise and rhythms with a degree of improvisation it's clear that Sutcliffe Jugend are taking their sound into new territory on With Extreme Prejudice. At no point do the duo of Kevin Tomkins and Paul Taylor rely on all-out confrontational noise. Instead With Extreme Prejudice they allow a degree of space within their compositions with a varied and surprising assortment of instrumentation. Not many noise releases can count violin and a prepared autoharp amongst the instrumentation - even if they are twisted beyond recognition. 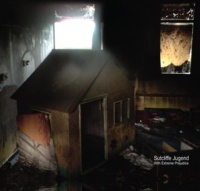 It's clearly apparent that the menacing vocal of Kevin Tomkins remains key to the Sutcliffe Jugend assault as he takes on personas to play out the more insidious aspects of this brutal and particularly complex release. The title track may be the nearest representation of power electronics (remember Kevin Tomkins was once a member of Whitehouse, a long time ago) but it, like much of the album, is incredibly dense and textured. From lashing scrapings of electronic frequency noise Tomkins' spits out words in a rabid frenzy, punctuating the noise with his bile diatribe, just as the music cuts to quivering, electronic drones amidst an almost horror carnivalesque organ chime. Power electronics by numbers this ain't. Both Kevin Tomkins and Paul Taylor have been releasing solo albums via their own Between Silences label and this varied experimentalism seems to feed into With Extreme Prejudice. There are a number of structured sound pieces here in the form of 'I Have Kissed this Sick World Goodbye' and 'Carnage'. The former is a collage of cut-up jarring frequencies and tones, while the latter casts jerky elasticated effects and noise injections alongside incessant chattering tones over a heavy wavering drone. It all adds a new dimension to the noise assaults. With a barrage of buzzing guitar and jarring, electronic bleeps, the distant heavily distorted rhythmic vocal hollering matches the pummelling rhythm of 'Beaten'. 'Empathiser', meanwhile, pulses with rhythmic bleeps and distorted noise to a tormented spoken narrative sounding not unlike Karl Blake - though, given the dubious nature of the lyrics, he wouldn't thank me for saying that. The entire thing beats like a mutant noise take on electro-pop, and again it's something you wouldn't expect on a noise release. Like Pigdaddy, their last album on Cold Spring, With Extreme Prejudice centres around a number of disturbing narrative based tracks allowing Tomkins to act out personas while giving free rein to his own philosophical outlook. This approach is best represented by 'Lucky' a grubby sexual fantasy about a low rent, lowlife character littered with sadistic overtones over a restrained backdrop of deep electronic tones and buzzes. It's a dank, humourless moment of depraved, sexual violence. Slightly less effective is the humorously titled 'Death Of A Post Christian Humanist' which catches Tomkins' sinister whispered unsavoury outpourings over ambient noise electronics. Tomkins vocal is at its most contrived on 'Oblivion' where it comes across, once again, like a drunken rambling Tom Waits, over sparse guitar notes and a mass of wailing voices, just as an atmospheric drone continually rises from underneath.